Wanstead Birder: Muffin hits the Jackpot! 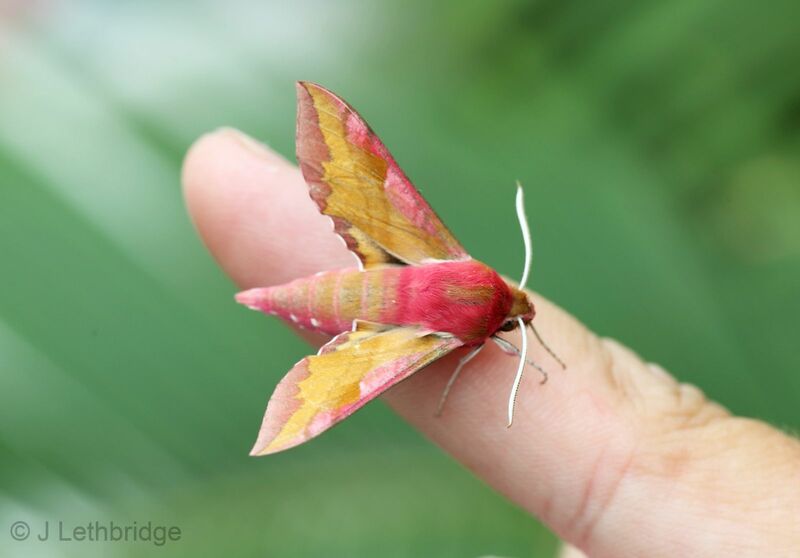 Apologies in advance, for this post is unashamedly about moths. Or rather, one particular Moth. As usual the actinic trap was set up in the garden, but the weather didn't look or feel particularly mothy. What the hell, you never know. A reasoned approach. Me: Anything in the trap? Muffin: Nah, not much. A couple of Dark Arches, a Heart and Dart, a Scalloped Oak and some kind of Tortrix. Start them young eh? The other advantage is of course that I can laze around in bed whilst the hard work is done by someone else. And this is what I was doing this morning when I was awakened by high-pitched screams of "Daddy!" from the garden. Really quite loud screams, loud enough to also wake up Pie, which takes some doing. My befuddled brain considered two possibilities; That he had been stung by something vicious that had got into the trap, or that there was a good 'un in there. Thankfully it was the latter, and he had hit the Jackpot! 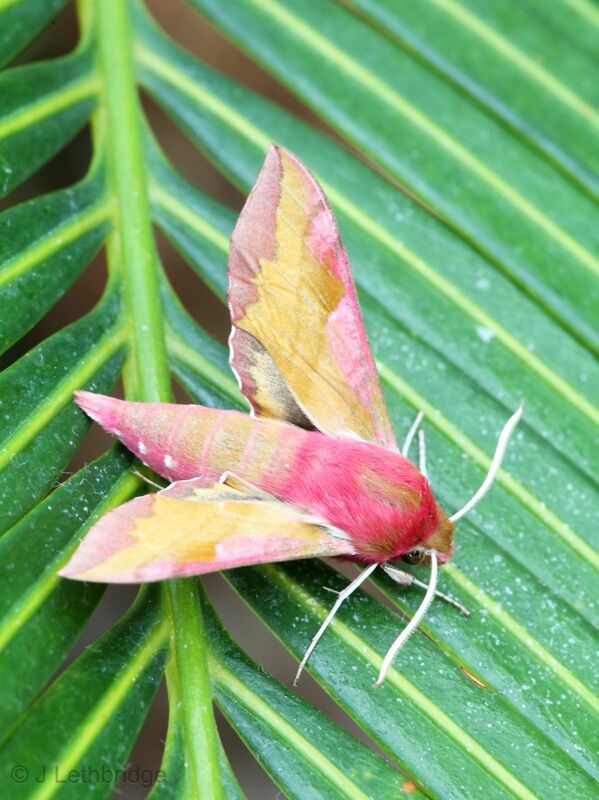 I made it down the stairs just as he came steaming in from the garden shouting "Small Elephant Hawkmoth!!!!!" at the top of his voice. He hadn't even looked at the book, but I didn't doubt him for a second, and as, shaking, he proudly handed me the potted prize, I knew he would remember this for a long time. The moth is a thing of beauty, and a first for the garden, in fact a first for the whole family, anywhere. It immediately usurps Scarce Silver Lines as the best ever garden moth, and may even be twitched by various members of the East London Moth-lovers Organisation (ELMO) tonight. I was very careful photographing it lest it do a runner. Utterly superb. Now that's a great looking Moth !!! My question is: how do you go about deciding where to look in the book for Brown Moth #26 that you've just caught? Or is it really a case of starting from the beginning and working your way through until you begin to get a feel for where to look, as in when you first picked up a bird book? Steve, I've got bad news for you. 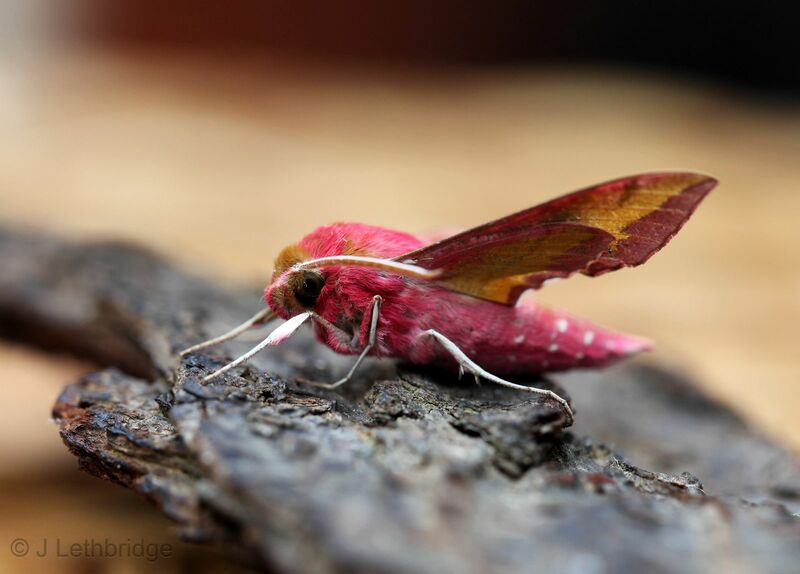 There are about 2400 species of moth in the UK, 800 big ones, 1600 small ones. I have a book that covers the big ones only, and to begin with I simply flicked through the book, cover to cover, until I found it. Nowadays I can go on shape to a certain extent, which broadly speaking is based on family, and work from there. It is still bloody difficult though, but REALLY GOOD FUN! Fantastic! And I always knew that boy would go far. I love the moths posts. Yes it's the macro moths I'm going to want to start with... the thought of 1600 potential IDs for a 3mm long brown thing fluttering about just fills me with despair. Good to know that shape can be a good indicator, stupidly hadn't really considered that. Anyway, many thanks for the tips and reply, I'll be out with my torch and white sheet tomorrow night. From the name I expected something large but brownish gray and boring-looking. Couldn't be more wrong--what a beauty! If anything could get me moth-watching, this would be it. It's like the moth version of a roller.